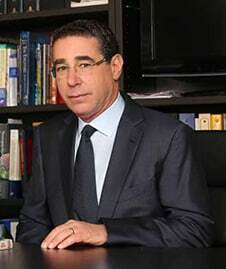 This article is based on a presentation given by Michael to the American Academy of Matrimonial Foundation, in 2017. Michael Kaplen discusses the serious, and under reported problem of brain injuries caused by domestic violence in the USA. Many people only associate traumatic brain injuries with athletes, members of the military, and with young adults who are victims of high speed motor vehicle crashes. The Department of Defense spends millions of dollars each year researching innovative technologies to enhance and expedite identification of TBI in returning veterans from Iraq and Afghanistan. The National Football League commits Billions of Dollars to settle a class action lawsuit brought on behalf of retired players suffering the consequences of Traumatic Brain Injury and millions of dollars to fund research. Because of inadequate screening and identification, brain injuries and brain damage of survivors of domestic violence remains unrecognized and untreated. Victims of domestic violence who suffer the lasting effects of traumatic brain damage rarely have the support, finances, and other resources to obtain the assistance and funding they so desperately need. 1 in 4 women in the United States, according to the Centers for Disease Control and Injury Prevention (CDC), are estimated to be survivors of domestic violence! One recent study in Arizona, has estimated that 20 million women each year could be victims of a domestic related Traumatic Brain Injury. 8 percent were hit in the head over 20 times in the preceding year. 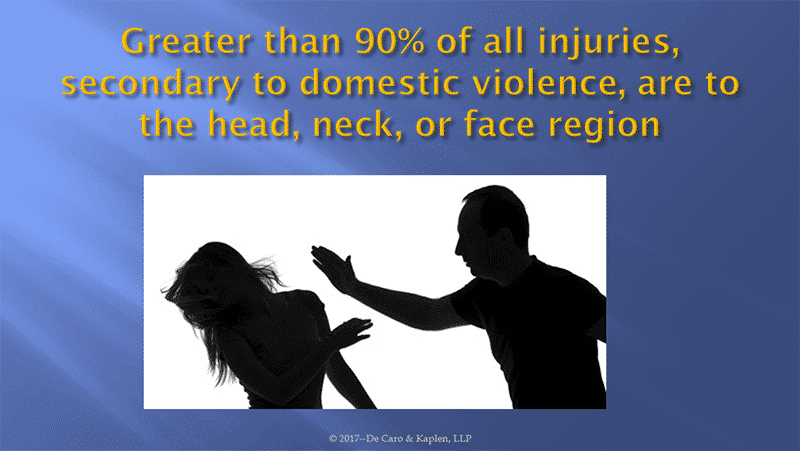 Domestic Violence does not discriminate based upon income, and neither does traumatic brain injury. A brain injury and domestic violence can affect anyone, anytime, and anyplace. But a brain injury is often difficult to detect, because it is an invisible injury. The brain is damaged by its rapid movement within the skull causing it to strike the hard and rough interior surface of the skull causing ripping, tearing, stretching, and bruising of nerve cells. Following a brain injury an individual may appear to be fine but nonetheless may be suffering a multitude of physical, emotional, and behavioral injuries caused by the brain damage they sustained. Common causes of brain injury caused by domestic violence include: Closed head injuries occurring when the victim is punched, shaken, or shoved. It can also occur when someone’s head is struck by an object, or when his/her head is slammed onto a surface. Strangulation leads to deprivation of oxygen to the brain, or hypoxia can cause brain damage. This can also be caused when someone’s head is pushed into the bed, causing breathing difficulty. The brain utilizes as much as 25 % of the oxygen we inhale. It is the brain’s fuel. Oxygen deprivation causes the death of brain cells and brain damage occurs. Strikingly, the victim need not lose consciousness for the brain damage to result. Decreased blood flow to the brain can cause brain injury. 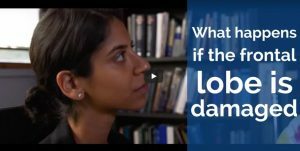 In California, a new law will become effective in January 2018 directing all California law enforcement agencies to ask victims of domestic violence if they were strangled, and further to document any evidence of strangulation. Mary will never forget the moment her husband, grabbed her by the neck and threw her against a wall. Over the next several hours, Mary developed nausea and headaches. She felt like the room was spinning. Over the next several days, Mary realized she was having difficulties reading and remembering simple things. Her sleep was affected—she was sleeping longer than usual. By midday, she was exhausted. She wanted to go to the emergency room, but her spouse wouldn’t take her. She wanted to call for assistance, but her spouse wouldn’t let her use a phone. She wanted to see her family physician, but her spouse refused to pay. Relatives and friends observed that May had mood swings and fits of rage. Mary continues to suffer from depression. Her memory has substantially deteriorated: she misses appointments, has to leave post-it notes all over the home to remind her of even the simplest things. She even forgets to pick her daughter up at the bus stop at the end of the school day. Almost one year later, Mary still struggles with debilitating headaches, cognitive fatigue, and memory loss. Mary sustained a traumatic brain injury that changed her life forever. She will spend the rest of her life dealing with an undiagnosed, untreated, and unsupported injury. Brain trauma is typically invisible to the unassisted eye. Often, there are no visible signs of injury. There is a misconception that if abuse occurs, there must be physical, observable signs. 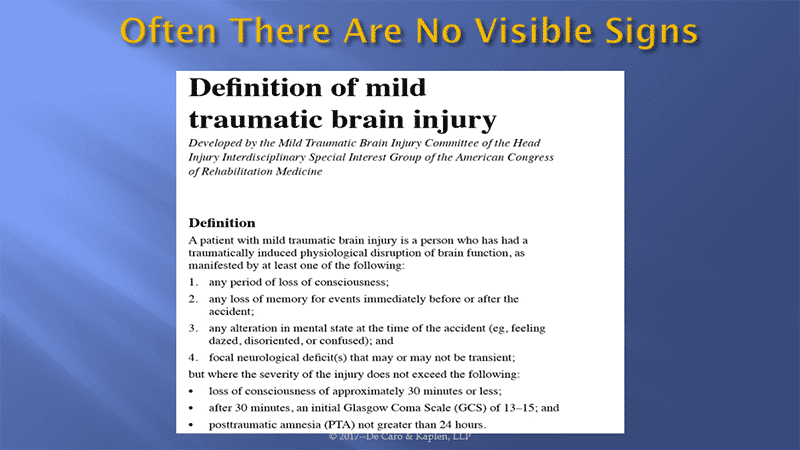 TBI, is often termed the “invisible injury” by professionals, because there are no physical signs. 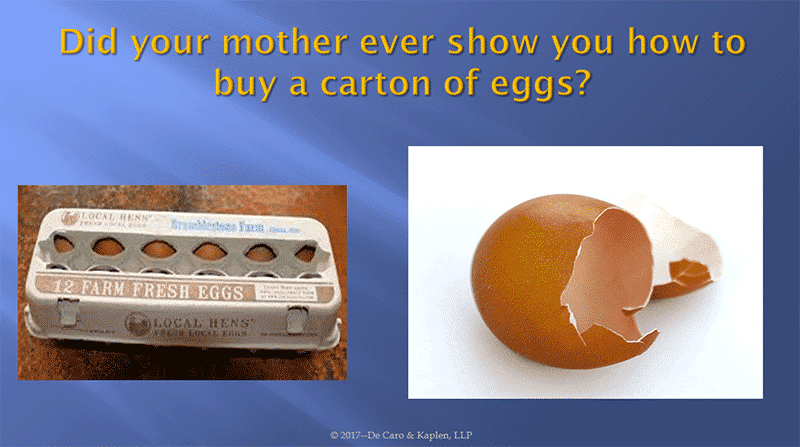 It is valuable to compare the mechanism of brain injury to shaking a raw egg, which leaves the shell intact but ruptures the yoke within. Even if the egg is shaken vigorously, the shell remains unbroken, but the yoke is scrambled. In actual brain trauma, it is often impossible to visualize the forces or events causing damage, but the resulting damage is discernible. We may not witness an electrical surge, but may appreciate the havoc it may wreak on malfunctioning appliances. Injury to the brain can occur absent any direct external trauma to the skull. The rapid acceleration and deceleration of the brain within the skull, causes damage to nerve fibers and brain structures. The skull, (cranium or vault), is the bony structure surrounding the brain, and protects it from outside forces. Closed head injury is caused by the movement of the brain within the skull itself, causing tearing, ripping, and stretching of nerve fibers, typical in vehicular accidents involving sudden movement of the head. External forces initiate movement of the brain within the skull frequently causing no injury to the skull itself. When the brain slides within the skull, contact with the interior sharp ridges and edges can cause damage to the brain’s soft tissue. These forces cause the brain to move forward, backward, or rotate within the skull cavity and forcefully propel it against interior protrusions, causing bruising, bleeding, and nerve destruction. Most of the bony prominences are in the front and sides of the skull injuring the frontal area (frontal lobe) and the side areas (temporal lobe). The frontal and temporal lobes are responsible for cognitive functions such as memory, concentration, and impulse control. This offers insight into why many people who sustain traumatic brain injuries have frontal and temporal lobe damage and symptomology. Traumatic brain injuries often result in memory and multitasking difficulties, and cognitive fatigue. Memory, (the ability to recall), is the product of numerous discrete actions along the neural pathway and is complicated. First, information must be received, (auditory or visual), then processed, stored, located, and ultimately retrieved for use. A brain-injured individual may have a disruption anywhere along that route. Executive functioning (multitasking and decision-making), is the ability to engage in many tasks simultaneously, and is frequently impaired following a traumatic brain injury. The illustration of an individual simultaneously talking on the telephone, preparing a meal, while engaging with a child is demonstrative. Cognitive fatigue is also a common complaint of many individuals with a traumatic brain injury. Cognitive fatigue is to your brain and functioning as a computer with too many open programs. The computer continues to function, but in a protracted manner. Elementary physics principles apply to, control, and explain the movement of the brain within the skull. A body (or brain) in motion, stays in motion. When an individual is pushed or shoved, the victim’s head continues to travel forward in the same direction until the brain is stopped by the skull’s interior surface. The victim is thrown forward or backward causing his or her brain to move rapidly within the skull cavity itself. Similarly, when a victim of domestic violence is thrown to the ground, the head moves rapidly moving the brain within the skull, ending in an abrupt stop. In these situations, the brain, floating in cerebral spinal fluid, does not stop moving immediately, but continues, striking, and scraping against the skull’s interior rough, hard surfaces, causing injury. The brain may also be injured due to the stretching or tearing of nerve fibers by movement within the skull. The brain is not a homogeneous substance; but comprises many layers of varying densities. These disparities cause portions of the brain to move at different velocities with different forces applied to each region of the brain. One layer of the brain may glide over another. This intracranial movement at different speeds causes individual nerve fibers to be twisted or stretched, causing a “shearing” injury. Trauma to individual nerve fibers causes damage and a disruption in communication between nerve cells. 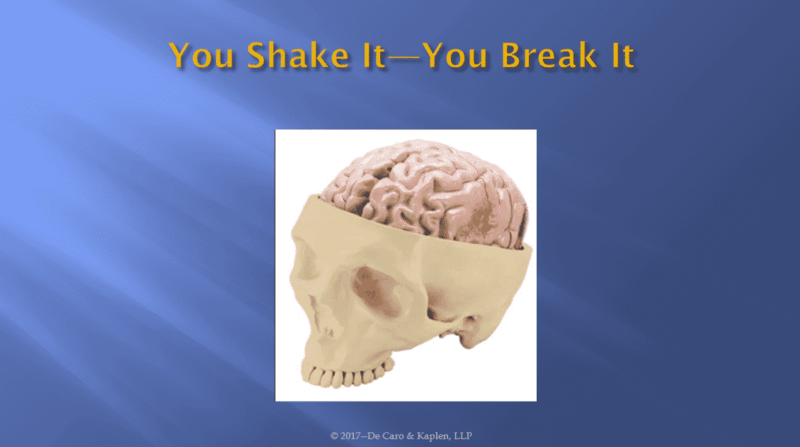 The violent and sudden movement and turning of the head which frequently takes place when a victim is thrown or shaken can also cause rotational damage to the nerve fibers. Injury to the brain may occur in more than one location. Most obvious is the site of impact with an object (coup injury), where there is actual contact between the skull and an object. Injury can also result, however, from the rebounding of the brain in the opposite direction, following impact (contrecoup injury). When the brain rebounds, the portion of the brain on the reverse side can strike the skull, causing damage opposite the site of initial impact. When a moving object strikes a stationary skull, such as a baseball bat striking a head, the initial, coup injury, will be more severe. When a moving skull strikes an immobile object, (such as when an individual falls to the ground and strikes his/her head), the rebound injury, or contrecoup injury, will be more severe. Brain movement is sometimes linear (forward and backward), but may also rotate within the skull. The rotational forces cause a shearing of brain tissue and resulting stretching and tearing of brain axons. This disrupts the ability of the neurons to communicate with each other. This injury is termed, Diffuse Axonal Injury (DAI). Significantly, it is a major cause of brain damage, impaired consciousness, and death. 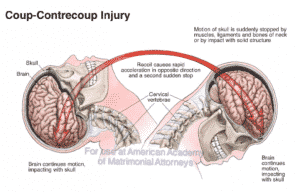 Attorneys searching for objective evidence to document brain trauma caused by a whiplash type event may be frustrated. Traditional radiological studies, such as CT or MRI are not sensitive enough to display microscopic stretching, tearing, and shearing of nerve cells. The medical adage, “absence of proof is not proof of absence,” is important to remember. Newer imaging techniques, such as Diffusion Tensor Imaging (DTI) may offer assistance in demonstrating brain damage previously undetectable by traditional imaging studies. With the present state of imaging technology, however, attorneys must generally rely on the testimony of neuropsychologists and lay witnesses who can establish the victim’s condition prior to physical abuse. Hospital screening for TBI in Domestic Violence Patients is Inadequate. Victims of domestic violence are not routinely screened for TBI even when they present at the hospital with physical injuries. 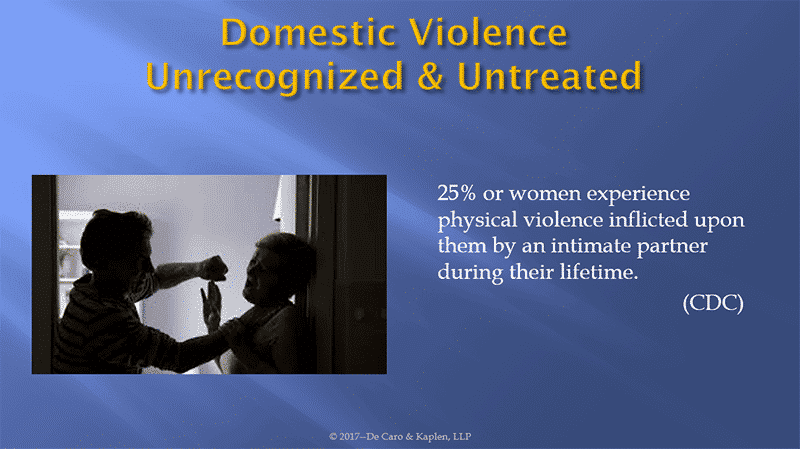 The majority of domestic violence victims receive no diagnosis of TBI, in part because they do not have visible injuries, and because there is a lack of screening. If a child comes in from the soccer field or football field with physical injuries or complaining of headaches or nausea he/she is worked up for a TBI, but not victims of domestic abuse. A study of the accuracy of emergency department diagnosis of traumatic brain injury found emergency room physicians fail to accurately diagnose a mild traumatic brain injury 56% of the time, despite the patient exhibiting symptoms that meet the definition. Domestic abuse survivors are frequently victims of repetitive head trauma. These repetitive injuries pose additional risks. A victim is more susceptible to a second concussion if it occurs before there is a full recovery from an initial concussion. There is a higher risk of permanent injury if a second concussion takes place before full recovery from the initial concussion – decreased threshold. Repetitive sub-concussive blows may cause permanent brain damage. All survivors of domestic violence must be screened for various forms of physical abuse that could lead to brain injury. A special screening tool known as “HELPS” aids in determining whether a victim entering a domestic violence shelter should be seen by a qualified medical provider for further evaluation. Did your partner ever Hit you in the face or head? With what? Did your partner ever slam your head or another object, or push you so that you fell and hit your head? Did your partner ever shake you? Did your partner ever try to strangle or choke you, or do anything else that made it hard for you to breathe? Did you ever go to the Emergency room after an incident? Why? Did they ask you whether you had been hit on the head or indicate that they suspected a head injury or concussion? Was there ever a time when you thought you needed to go to the ER, but didn’t go because you couldn’t afford it or your partner prevented you? If you did go to the ER, did you think you got all the treatment you needed? Did you ever Lose consciousness or black out as a result of what your partner did to you? Have you been having Problems concentrating or remembering things? Are you having trouble finishing things you start to do? Are people telling you that you don’t seem like yourself, or that your behavior has changed? Does your partner say you have changed, and use that as an excuse to abuse you? Have you been having difficulty performing your usual activities? Are you experiencing mood swings that you don’t understand? Has it gotten harder for you to function when you are under stress? Have you been Sick or had physical problems? What kind? Do you experience any reoccurring headaches or fatigue? Have you experienced any changes in your vision, hearing, or sense of smell or taste? Do you find yourself dizzy or experience a lack of balance? It is important in working with any brain injury survivor he/she be treated with dignity and respect. Understand their injuries and the many ways they can affect and impact your professional relationship. The following are useful strategies to improve communication and develop good rapport with your client. Victims of brain injury feel misunderstood. They may look and sound fine, but they may have devastating brain damage that affects their ability to navigate day-to-day life. Because they are judged by their outside appearance, the seriousness of their condition is often not appreciated by legal and medical professionals. Brain injury victims have lost a part of themselves. They struggle every day with their deficits and losses of who they used to be. 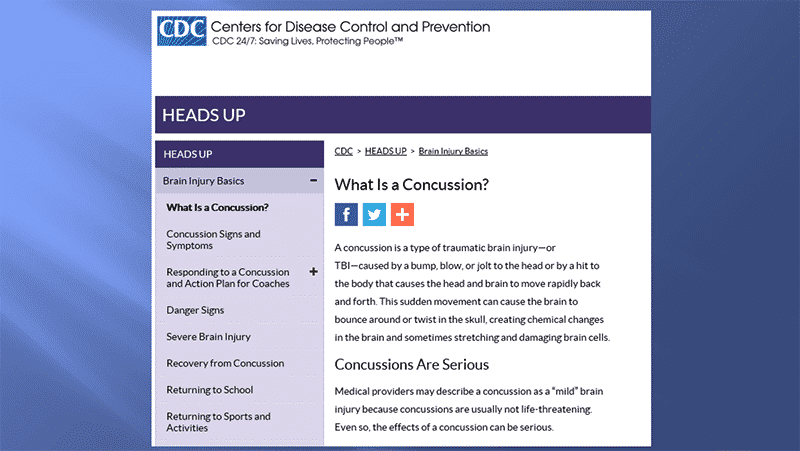 For more information on traumatic brain injuries, see our guide.